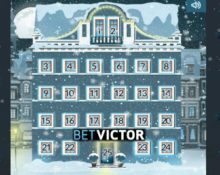 BetVictor – Christmas Calendar | Week 2! Get hampered on Day 5! Season celebrations kicked off on 1st December 2017 at BetVictor with tons of festive treats for the Casino, the Live Casino or on Sports going to their loyal players in the first four days. And there is more to come until Christmas Day as players can look forward to more Free Spins, Deposit Bonuses, Free Bets, Tournaments, 2 Prize Draws for holidays and so much more. Make sure to log in every day to open the next calendar door for your festive surprise. The crew at BetVictor assembled for this year yet again a superb festive Christmas Calendar where players can open a new door every day to reveal sweet treats such as Free Spins, Deposit or Wager Bonuses, Free Bets, Raffles, Tournaments and more. Make sure to log-in every day to reveal the next offer. Wagering requirements are 35x bonus and 30x FS winnings, subject to the BetVictor casino bonus terms and conditions. Free Bets and other sports betting bonuses may have wagering attached, subject to the Sports bonus terms. Earn one ticket to the prize draw for every £10 wagered on Spirits of Zen, Arctic Party or Congo Bongo. Draw will be held on 6th December and winners notified shortly after. Prizes are 3x Harrod’s Hampers, worth £300 | 1x £200 bonus | 1x £100 bonus | 5x £50 bonus | 10x £25 bonus | 20x £10 bonus. Hamper winners from outside the UK or Northern Ireland can opt for a £300 cash alternative. Wagering requirement for the bonus prizes is 35x bonus amount on Spirits of Zen, Arctic Party or Congo Bongo only. Play on Viking Runecraft with any bet size and collect 10 points for every Runes of Valhalla bonus feature. The TOP50 scorers will receive 50 – 500 Free Spins on Viking Runecraft. Everyone collecting minimum 10 points will receive 15 Free Spins, all credited on 7th December 2017 with no wagering requirements. Earn one ticket to the raffle for every £10 wagered on tables and five tickets for every £10 wagered on slots. Draw will be held on 8th December 2017 and prizes credited shortly after. Prizes are 1x £500 cash | 1x £200 bonus | 1x £100 bonus | 7x £50 bonus | 10x £25 bonus | 20x £10 bonus. Wagering requirements for the bonus prizes are 20x bonus amount within five days. Deposit £10 to instantly receive a £10 bonus. Wagering requirement is 30x bonus on Santa’s Paws only within one day. Wager minimum £25 on Book of Dead to instantly receive a £5 Free Bet that can be used on any market. Free Bet has to be placed separately from other bets. Only winnings exceeding the stake will be credited as cash, no wagering requirements. Earn one ticket to the prize draw for every £10 wagered on Happy Holidays. Amount of entries per player is not limited. Draw will be held and winners notified on 11th December 2017. Prizes are 1x iPhone X 64GB | 1x £200 bonus | | 1x £100 bonus | 5x £50 bonus | 10x £25 bonus | 20x £10 bonus. Wagering requirements for the bonus prizes are 20x bonus amount within one days. 11th December 2017 – Check back tomorrow when we reveal the next Christmas offer.